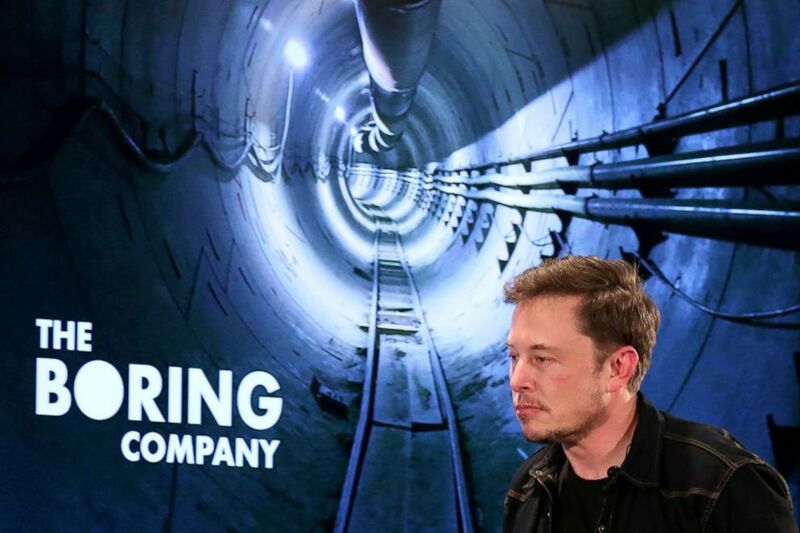 Elon Musk is unveiling The Boring Company's test tunnel at a press conference. 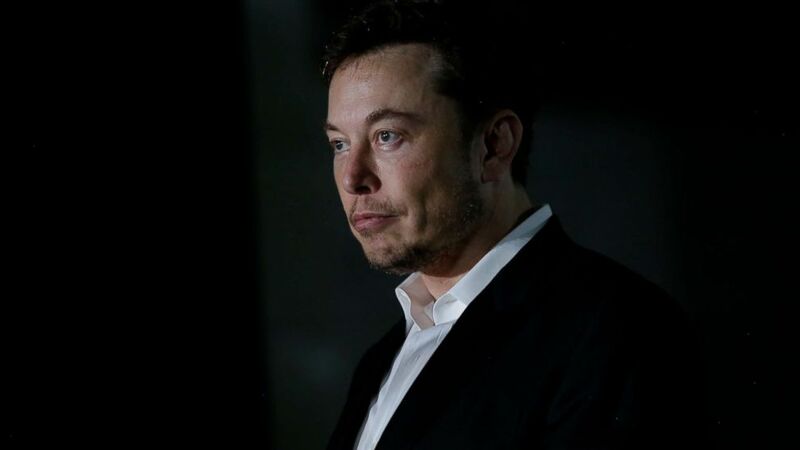 Two years ago, Elon Musk tweeted complaints about Los Angeles traffic, declaring that he was "going to build a tunnel boring machine and just start digging." On Tuesday, The Boring Company unveiled its first underground tunnel, built for the future use of autonomous cars and the still-theoretical Hyperloop high-speed train. The test tunnel is located in Hawthorne, a neighborhood near Los Angeles International Airport where Musk’s other company, SpaceX, is located. For now, the tunnel is not cleared for regular passengers, and there's no timetable for when it could. It runs at about 35 to 40 mph -- and is a bumpy ride. But Musk promised reporters who got a test ride that once paving was figured out, it would be "smooth as glass." "To solve the problem of soul-destroying traffic, roads must go 3D, which means either flying cars or tunnels. Unlike flying cars, tunnels are weatherproof, out of sight and won't fall on your head,” The Boring Company wrote on its website. “A large network of tunnels many levels deep would help alleviate congestion in any city, no matter how large it grew (just keep adding levels)." (Lucy Nicholson/Reuters) Elon Musk arrives to speak at Boring Company community meeting in Bel Air, Los Angeles, Calif. May 17, 2018. There has been a medieval theme to many of the Boring Company's tweets, inspired by Musk's admiration of "Monty Python." The costs are still uncertain. Musk told reporters, on the test ride on Tuesday, that a pedestrian would ride for about $1, while a car would cost about $4. It will also depend on sponsorship money raised, which Musk said would not be a problem. “We have no problem with investors, we have people hounding us to invest non-stop,” he said. (Joshua Lott/Getty Images) Engineer and tech entrepreneur Elon Musk of The Boring Company listens as Chicago Mayor Rahm Emanuel talks about constructing a high-speed transit tunnel at Block 37 during a news conference, June 14, 2018, in Chicago. The Boring Company originally planned a test tunnel on LA's west side in a neighborhood close to the country's most populated highway, the 405 freeway. After protests from neighborhood groups, the company abandoned plans to build another tunnel there. "The purpose is to demonstrate that a lift can be built in very small footprints and within existing buildings, whether they are houses, office buildings, or retail parking lots,” the company says on its website. “Looking forward, one could have a lift in the basement of every office building, allowing extremely convenient commutes." The company is already at work on a tunnel between Baltimore and Washington, D.C., and Musk mentioned hypothetical tunnels in Las Vegas or Chicago. Right now, the boring machine runs at a snail's pace, literally. In fact, it's 14 times slower than a snail. But Mush expects to speed up the drill by 15 times -- eventually.